patterntology: Real Life Artwork Sold in Second Life! Real Life Artwork Sold in Second Life! I actually sold a real painting for real money from marketing in Second Life. I'm awaiting a check for $300 in the mail and will ship it off right away. 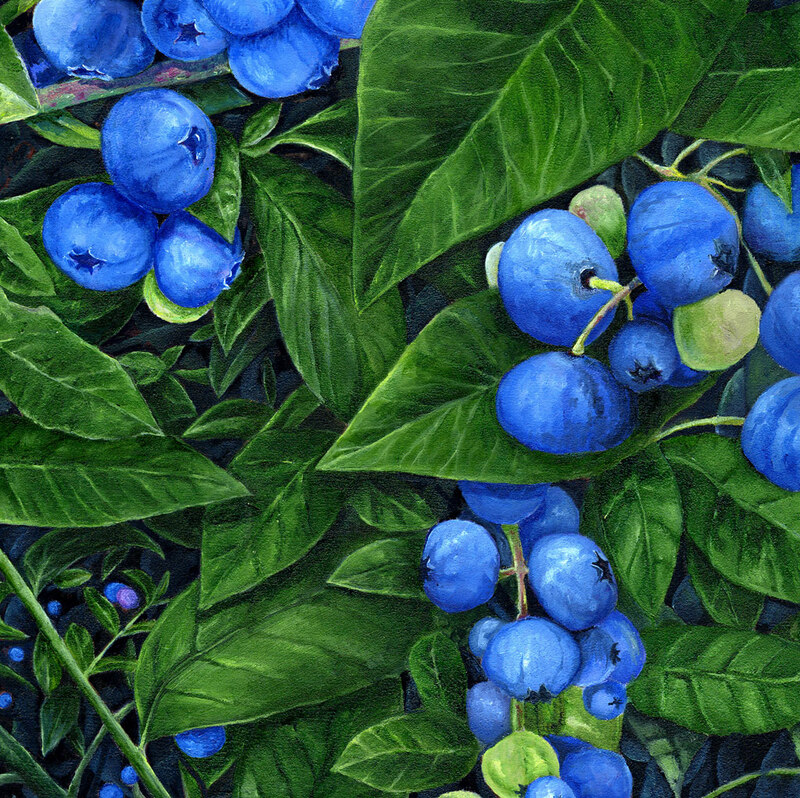 I sold blueberries! There is a birthday I didn't realize I had until recently. My "Rezzing" birthday. Yes, I (Quota Soon) and partner Kyle Beltran (aka Kyle Bronsdon) in Second Life, have been in virtual reality for a full year. This birthday also coincided with our accepting the generous gift of being hosted on the island of Pulaski Fizz (Second Life celebrity). A week of furious designing and building ensued with a grand opening of our new club/gallery in Second Life called Meatspace. So, four club moves and redesigns in one year. We also make a profit with each move as real estate has real monetary value. I will admit that my general attitude towards this venture has been less than positive in most respects. Second Life had a crucial pr problem with over estimating it's member growth rate. Second Life is in continual Beta creating a sort of "connectivity weather" for its users. You never know what isn't going to work. But it isn't going away. Linden Labs is partnering with Sun Microsystems to create a universal VR platform. I feel like I am in the Beta of what will be the future of VR. The accomplishments thus far are astounding: a real world based on real money with real commerce, a revolutionary 3d creation tool available to every user, 3d tools including organic nurb tech, a scripting language (animation, etc.) applicable to any object or avatar in the world, streaming music, streaming video and voice chat. Everything is going to change once internet and database applications can be connected to Second Life. It will then be the VR it's promising the world. There are a lot of budding entrepreneurs in Second Life. Designed to cater to the creative, most are terminally un-talented. If you spend 50-60hrs a week in-world, you're going to get good at something. Being a chronic gamer does not necessarily make you creative. If you're like me, a real world artist trying to sell real art in the virtual world, you get discouraged. But then again, I never tried selling, I am just there. Then I sold a piece of art. In the real world. A real painting someone only saw in Second Life. Let me clarify. In Secondlife I have a gallery with images of my artwork. Secondlife patrons can visit my gallery and buy my Secondlife images for $300 Lindens (about one US $1.) They usually go put this in their Second Life house. In a year, I've sold maybe 30 this way. Marketing... I also link all these images to my website and advertise the fact that you can buy the actual paintings. Someone did. In Second Life I have a huge gallery I designed myself. I can show tons of work. Customers also get to see me and talk with me whenever I am there. I can sell the work, like I would sell the work in a real gallery. My avatar (or doll) appears as a real person and there is a real discourse that happens.